This section identifies a few software tools that can help you explore how electric power set-ups might work. You can compare alternatives by calculating the effects of different component combinations to see what fits your need best. They can also assist you in judging how a particular combination might perform, so you can optimise a solutions, or at least be confident that a given set-up has a good prospect of meeting your expectations. On-line tool. Predicts and graphs key operating parameters for two motor/prop/battery voltage combinations. On-line tool. Predicts and graphs how a propeller will perform under given conditions (RPM, voltage, current or power) and calculates efficiency. Downloadable freeware application. 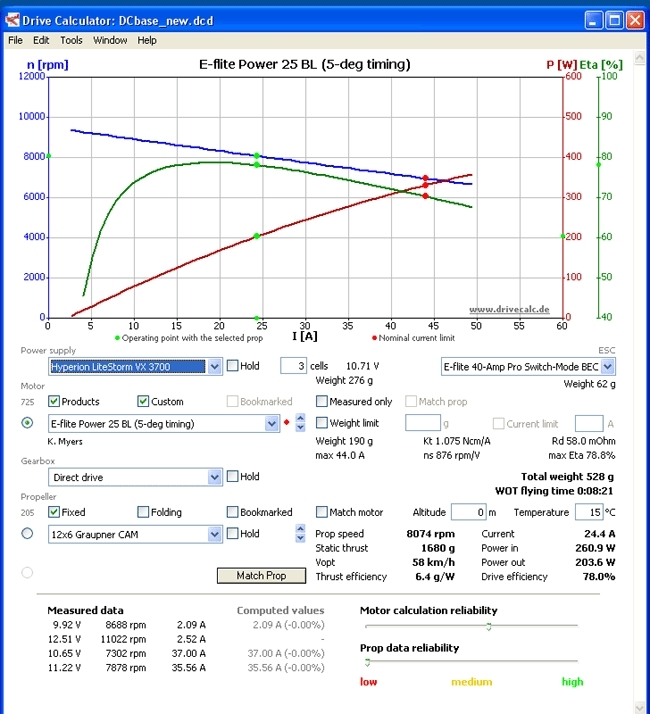 A tool that can be used for DC motor analysis and as an aid in the selection of the complete power system for electrically powered model aircraft. Purchasers of commercially available products can use the program to help guide them to a suggested combination of power system components for a given model aircraft. The program can also help motor builders optimise the results of their work. Downloadable freeware application. Calculates performance parameters (using imperial units).